With its incredible open world, Breath of the Wild is brimming with memorable moments — both big and small. It’s what makes the game so enthralling and fulfilling, for me anyway. I live for those moments of delight and discovery, and that’s exactly what Breath of the Wild is all about. Any time I think of a random area in the game, I can immediately recall a memory related to it. 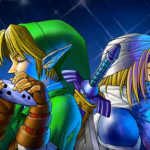 I’ve covered a lot of my favourites in other articles, including my discovery of Gerudo town and the Lord of the Mountain, so in this one I’m gonna look at some smaller yet equally-enjoyable recollections that stick in my mind. Celebration of the Wild is a month-long celebration of the anniversary of this beloved game. All month long we will be picking our favorite songs, fan works, places, memories, and more of this wonderful addition to the Zelda series. 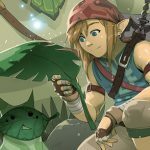 Breath of the Wild has revolutionized the franchise all for the better and it’s only suiting we take this month to celebrate its achievements. Although they’re numbered, these are in no particular order. 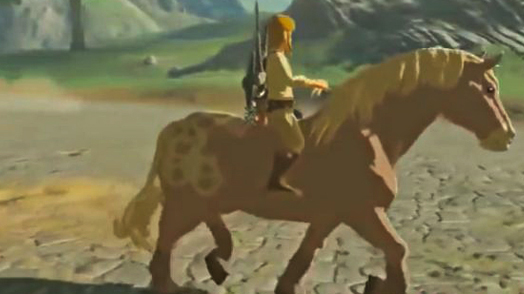 Who could forget their first horse in Breath of the Wild? The story of mine is somewhat bitter-sweet — no it didn’t die! I was in the field just west of the Duelling Peaks, fighting the Bokoblins on the shore and rolling fields, until I saw a Bokoblin riding a horse charging towards me. I killed the Bokoblin and went to see if I could calm the horse down. It was such a pretty horse, with a pink body and cream-coloured blotches. Once I tamed it, I was so giddy to have my first horse that I took it with me everywhere I could — through a nearby wooded area, to another Bokoblin camp, along the river, and so on. I always made sure I kept it nearby, as I didn’t want it to get hurt or taken by an enemy again! I eventually had to quit the game and, sadly, I didn’t know that to keep your horses you had to register them at a stable. I later realised there was a stable literally a stone’s throw away from where I quit, but by then it was too late. I lost the horse. I didn’t even get to name her! Now’s my chance though…I’ll never forget you, Hana. 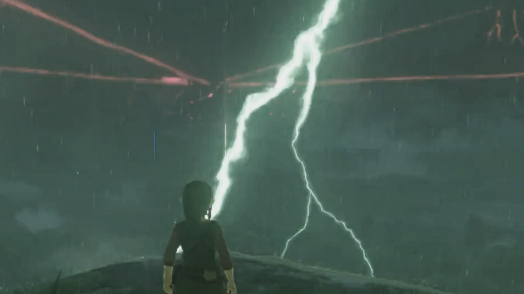 I can’t think of any other game that creates thunderstorms as strikingly as Breath of the Wild. I have two main memories of thunderstorms. Number one, the first time I was in one. It happened in a swamp near Kakariko village — there were some ruins and a Fire Wizrobe nearby. So I was not only facing a pretty-tough enemy early on, but also experiencing these crazy thunderbolts that were literally shaking the screen on impact. The first time one hit the ground right next to me, I was genuinely shocked (well…it missed me, so not literally). I love that a game could have that effect on me. My second memory is of the endless thunderstorm in the Faron region. I spend ages trying to find places to start campfires and pass the time to make the storm end, but with no success. I wondered if my game was glitched, until I eventually gave up, explored, and realised it was actually a shrine puzzle. I’m sure I’m not the only one this happened to…right? I love this little area, which sits just north of the Korok Forest. With its constant shroud of darkness, you have to change up your playstyle to make it through the ruins, and you can do so in whatever way you like. I remember using a meteor rod to light the path ahead of me. When that lost its durability, I switched to using a fire arrow intermittently and progressing bit by bit. I even read a comment on Reddit a while ago that said they took the Lord of the Mountain there, who lit up the area quite well! I’ve gotta try that. The whole experience in the ruins was relatively short compared to other areas, but nonetheless a really refreshing, enjoyable one. I wish there were more like it. Ahh, we can all remember that, right? Mine was the Lynel guarding the entrance to Lanayru Mountain. I quickly realised that this enemy was tougher than anything else in the game, even guardians and — let’s all admit — Ganon himself. Nevertheless, I felt stubborn and constantly tried to fight it. I remember wondering if this enemy was linked to a quest, and I recalled the shrine quest that asked me to ‘mount the crowned beast upon its throne / for only then the shrine is seen’. I thought I was so smart, thinking that I’d figured it out: that I needed to mount the Lynel! Of course! But alas, that was not the solution. 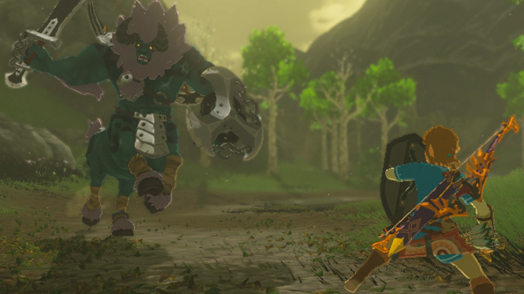 I realised I was totally overthinking it when the Lynel eventually kicked me off and no Shrine appeared, rewarding my bravery (or foolhardiness). I don’t think I actually defeated that Lynel until much later, when I learnt the dodging and attacking patterns. And the fact that Urbosa’s fury is overpowered. Credit to DA artist HeruKun for this amazing screenshot. 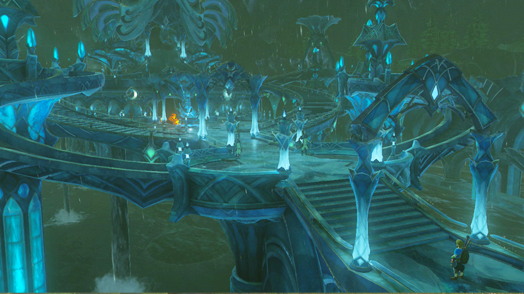 The journey up to Zora’s Domain stands out so much in my mind, as it created an incredible build up to it. I loved the history lessons you receive from the stone tablets along the way, and the sheer scale of the area. I truly felt like I was trekking into a region not often tread by the average traveller, and for good reason. The Lizalfos can be treacherous if you’re not careful, especially early game – and I know a lot of people went there first. 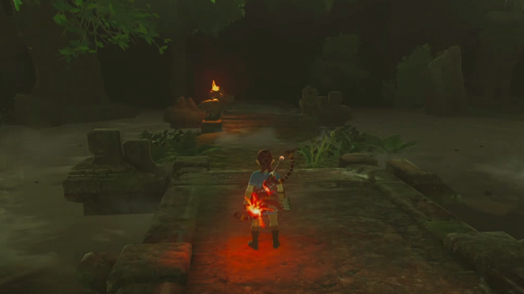 Compared to the Rito Village, for example, where you can literally just walk into the village, it felt a lot more rewarding fighting your way to the domain. The constant rain caused by the Divine Beast was an excellent mechanic that forced you to navigate the area properly — to prevent you from climbing and gliding straight to the end. I loved that. When you finally see the beautiful, glistening home of the Zora as a whole, rather than just glimpses, it’s breathtaking. I’ll never forget that moment: walking into this stunning place, clearly crafted by masterful architects, and hearing water flowing all around me. I wanted to paddle in the water and sleep on waterbeds forever. So you can imagine how much of a bummer it was realising almost every Zora there hates Link. There are so many more memories I have about this game, but that’s all from me this time! What are yours? Share them with us in the comments or on social media. We’d love to hear them!